Petualangan Randu: tigers! tigers! tigers! GOSH! I feel like i want to kiss my monitor! Mwah! Mwah! Mwah! Missed you so much! OK. What have i been doing since June 11...? For the past couple of months, i've been busy preparing Pre-Tiger Summit Meeting in Bali on July 2010. It was a regional staff meeting of 13 governments and NGOs on tigers.They are preparing some governmental commitment to save the world tigers and their habitats and planning to declare it on the big Tiger Summit in St. Petersburg next November. It was a really really tiring meeting and event. Well, at least for me. I had to run around on my heels and hurt my feet so bad. After the meeting was over, i couldn't even feel my toes for several days. Bad. Really...really bad. I prefer to hike all over Bukit Barisan Selatan forests than 10 minutes running on my 2,5 inches heels! Seriously! But it went well after all. I got a chance to do some major shopping WITHOUT my cards! I'm proud of myself. And i got a chance to meet my colleagues from WWF Network offices all over the world. It was so great meeting those guys. And I'm looking forward to work with them again in the future. After the pre-summit, i had to prepare another event. We have to choose two youth tiger ambassador to go to Youth Tiger Summit in Russia. It was very interesting process. We opened for applications for two weeks. 6 finalists were chosen and 2 of them were successful to be the ambassadors. Both ambassadors are GIRLS! Yay! They are really good, I'll tell you that! They are very experienced yet smart college students with a LOT better English than mine. I wanted to drawn myself to the Dead Sea. How embarrassing. However, it would be really nice to go overseas with them and to do some campaigns to save the tigers. You should too, by the way! Help us to save the tigers by not buying ANYTHING...ANYTHING made out of their body. (c) WWF-Indonesia/Maureen Nathalie. this nice tiger painting was made and donated for WWF by Maureen Nathalie from Global Art Bintaro. 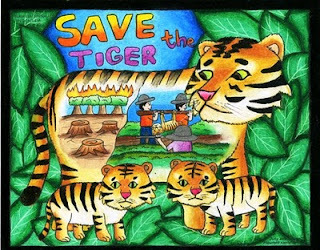 This painting was exhibited at Pre-Tiger Summit Meeting in Nusa Dua, Bali, July 2010.